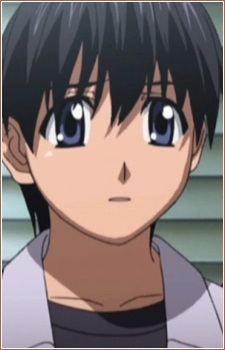 Kohta is one of the main characters of the series and is first introduced in Volume 1 when he arrives in Kanagawa Prefecture to attend college, having previously arranged to stay with his cousin Yuka while at school. Kohta enters the story when Yuka's family rents him a closed down inn as long as he maintains it, and begins living there with Yuka while going to a university. Kohta has repressed traumatic memories of witnessing the deaths of his father and sister, which later in the plot is revealed to be by Lucy's hand when she believes he's in love with Yuka and feels betrayed. Post Traumatic Stress Disorder brought on by the trauma of this event, caused him to end up in a psychiatric ward for over a year following the event. Due in part to his loss, Kohta is sympathetic towards girls in trouble and is extremely generous and protective to the girls around him, because he can relate to them and they remind him of his late younger sister, Kanae. He meets Lucy in his childhood when she is burying her dead puppy and running away from the orphanage where she killed 4 children. In the anime, he was visiting his cousin with his family and decided to go to the mountain to draw, taking with him a music box he had recently purchased which plays Lilium. He strikes up a conversation with her when she apparently likes the song from the music box. He finds her horns fascinating and gives her a hat to cover them up while in public, believing Lucy hates them. He asks her if they could be friends and spends time with her. He takes her to the zoo, telling her that he likes to look at the "strange animals." In Lucy's hallucination, she perceives this as the reason why he was so nice to her. He lies to her about the gender of his cousin by saying that Yuka is a boy so Lucy wouldn't be upset or jealous. When she finds out that he lied to her, she stows away onto his train, where Kohta is initially happy to see her. His sister, however, is terrified of Lucy, having seen her kill several dozen people at the fair. While attempting to protect her brother, Lucy rips her in half and decapitates his father. Before she goes to kill Yuka, a traumatized Kohta knocks her down and begs her to stop killing people. ...Kohta's repressed memories are triggered when Lucy kills a whole army in front of him, afterwards singing Lilium, the song that brought them together. He is more forgiving in the anime, effectively stating that she became a monster because everyone treated her like one, even kissing Lucy and stating that he still loves her and her Nyu persona though he proclaims that he cannot bring himself to fully forgive her for the murder of his family. ...he is truly unforgiving towards her for killing his father and sister. He, however, considers Nyu innocent of her more violent half's actions. Even though he was injured from trying to save her earlier, Kohta still decides to confront Lucy again, once again reiterating his desire for revenge. However, because both Nyu and Lucy share a body, he cannot bring himself to carry out his vengeance and instead offers her a peaceful life so long as she promises never to harm a human being again. Although Lucy initially agrees, a chain of events lead to her instincts betraying her and Kohta once again mortally wounded. She almost destroys the world in her despair, but manages to subdue her violent instincts upon deciding to save his life in return for hers. Upon regaining consciousness, Kohta finds that Lucy is literally melting away from her last act of selflessness. Unfortunately, the violent personality once again breaks through and starts assaulting the world once more. Kohta shoots and kills her at both Lucy and Nyuu's urgings, thus stopping Lucy's violent rampage once and for all. He names his daughter Nyuu in her memory and is seen visiting Lucy's puppy's grave over the years in order to honor a promise he'd made to her in their childhood. He then discovers a note Lucy had written and signed with her real name (Kaede) with Nyuu's help, buried near the stone. Kohta finally can fully forgive Lucy for the slaughter of his family upon reading it. As he is crying, Nyuu calls to a girl named "Kaede" and two twin girls with ribbons in their hair appear, heavily implied to bear some connection to Lucy and Nyuu. One states that they've been waiting for their special friend, to which Kohta finally turns around, smiling in joy with tears in his eyes.